Home - Seanautic Marine Inc.
Seanautic Marine Inc. is an International Sea Transport Agency established in 1983 specializing in shipping cargo to over 130 ports in the Caribbean, Central/South America, Mediterranean, Middle East, Africa, Pacific and Indian Ocean. We provide fast and efficient quality logistics and transportation services including Full Container Load (FCL) and Less Than Container Load (LCL), Roll-On/Roll-Off (Ro/Ro), and Break Bulk (B/B). 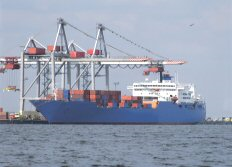 View our Routes and Destinations for sailing days and Container Equipment Specifications. Seanautic Marine head office is located in the heart of Vieux-Montreal with a regional office in Toronto, Ontario.